It is georgous and I am proud to wear it. I would definitely recommend it to anyone who asks about it. Wear this chic and dainty bracelet with your favorite outfit. 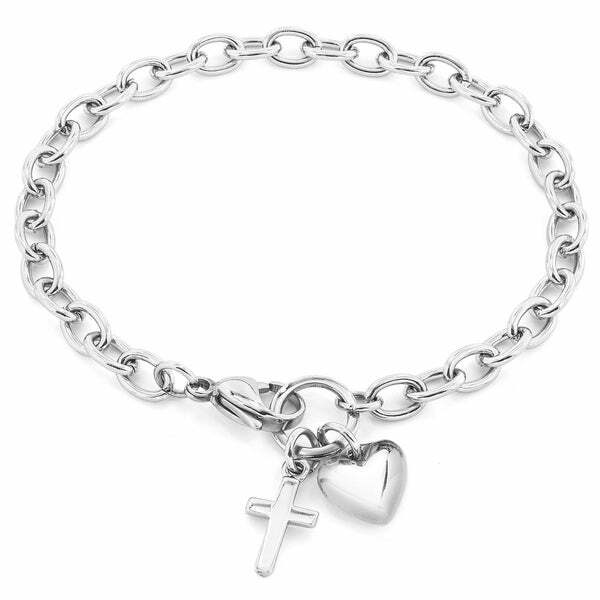 The bracelet has a cable chain and two small charms attached to the clasp. The charms are a polished heart next to a cross. The cable chain has a width of 6mm allowing you to clip other charms to make your own personal and stylish charm bracelet. The 7 1 /2 inch stainless steel bracelet secures with a lobster claw clasp and is perfect for everyday wear. This stainless steel bracelet is stain and rust resistant, durable, and hypoallergenic (unlikely to cause an allergic reaction). This bracelet barely measures 7", not the 8" that it is advertised as. I love this charm bracelet. It looks good as is or you can add other charms. Looks good for stainless steel and I can wear it with my Tiffanys Sterling Charms! Smaller than said, Cute, will give to my granddaughter. Cute but small. It you have a thick wrist it will be tight. She couldnt wait for this to come. She’s had jewelry allergies all her adult life and breaks out with most everything she wears. It’s been 3 weeks now and all is good. No breakouts and a happy girl. Looks like I’m headed back shopping. Thanks overstock for offering a great selection of stainless steel. I really loved this Charm Bracelet. Unfortunately, I lost it. I will definitely buy it again. It's made well & the chain isn't too thin. Love it ! The bracelet measured 7 inches not 8 as stated which is sad because it will not fit me. I will however give it to my daughter. The bracelet itself is really pretty and petite therefore I gave it 5 stars. I like the simple-ness of it and it pears well. I bought this for my granddaughter who is starting to appreciate jewelry. The cross signified her recent baptism and the heart our love for her. She loved it and we loved giving it to her! I would like for the chain to be daintier, but I like the bracelet. Very pretty. Not small, like others have stated. I bought for my 15 year old daughter, who is athletic and a little bigger boned/ muscular. It fits her perfectly. This is an amazing bracelet. It is lightweight. The charms are not big and gaudy. I am able to wear this on a day-to-day basis. I would recommend this product! Wear this all the time. Not heavy on the wrist. "What size is the bracelet? Would it be easy to make smaller?" Most of all, because it was Stainless steel. Also, because it was 8 inches around. And lastly, because I love hearts and the cross.